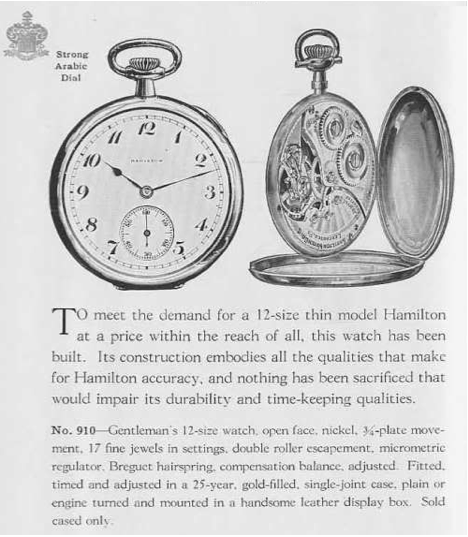 Hamilton made a variety of pocket watches before they introduced their first wrist watches. 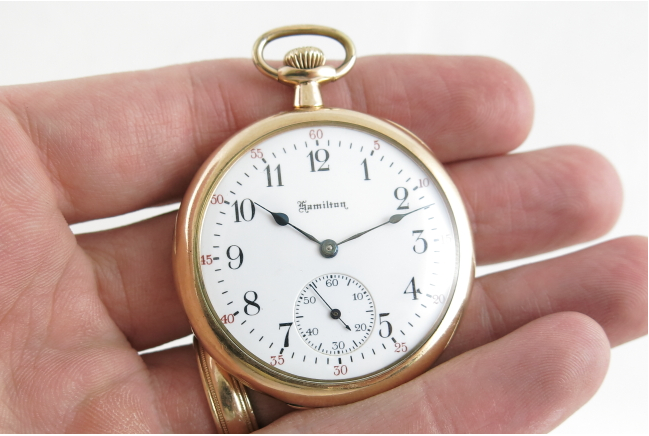 Pocket watches ranged in size from 6/0 sized ladies watches to 18 size railroad watches. Somewhere in between is their size 12 pocket watches. I recently picked up a Hamilton 17 jewel 910 pocket watch in a local shop. The movement dates to 1918. The 910 comes in a family of other 900-series movements in various jewel counts. It's a 12-size movement but it's a special design where the main plate is a larger diameter than the rear of the movement. Some folks view it as a cross between a 12-size and 14-size movement. What it really means though is that it goes into a special case which later 12-size watches won't fit (and vice versa). So to put a 910 (or similar) movement into a case, you need to have a case specifically made for that family of movements. My pocket watch came with everything except the crystal so after an overhaul to make sure it was cleaned and oiled, I installed a new glass crystal. This watch is pendant-set... so you pull the crown out to set the time and push it back in to wind it. 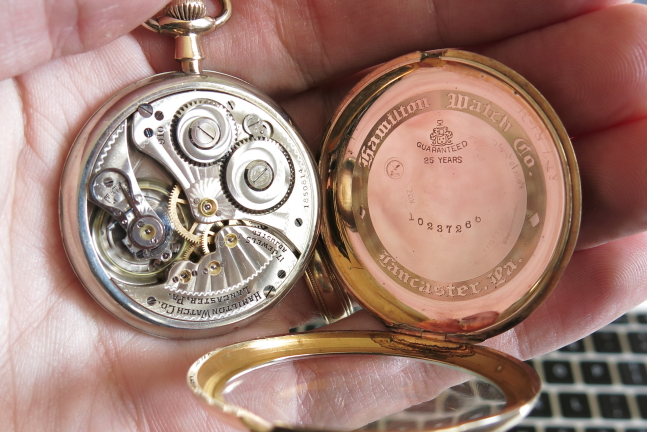 This pocket watch comes in a three-piece hinged case. So the center folds into the back, and the front bezel folds onto the dial. Then it all snaps shut. I just received a 910 and this has helped to identify it. By the serial number, mine was made in 1920. When it is wound, it runs like a rocket. The minute hand moves like a second hand. Can you tell me what the problem is likely to be and the cost of repair?